This guidebook entry was created by Jared Licht. DESCRIPTION: Indian Creek from the falls to the Y is a fun and easy class 3-4 run only 14 miles from Quincy. The creek runs along highway 89 between highway 70 and Greenville and is easily accessible. I recommend this run for kayakers who live in Quincy or are heading though the area, however to drive from anywhere else would take a bit of driving. If your looking to spend a few days in the area there are more runs, which would make a longer drive worth it. DRIVING DIRECTIONS: From Quincy head west on 70 for 11 miles, when you get to Highway 89 north (Greenville Y) take a right and fallow 89 for 2.9 miles. Follow the signs taking you to Indian Falls. RIVER GUIDE: Put in is a short hike down hill to the river; use the Indian Falls trail to get there. The best way to run the waterfall is using the river left side to hike up stream, Most any line here will go except for the far river left chute on the left bank. At times there can be a wave hole at the lip of the drop, you can punch through it or go left of center where you slide a short ways into an auto boof. Be careful of the under cut rocks on the left at the bottom. The first mile will be the most continues section of the run, this is a read and run class III-IV. After the first mile you will get to the biggest pool so far, the next rapid can be hard to scout but you can run the far left channel. Be careful here plenty of rocks to get pinned on. After bumping down the left you will have two ferries back to the right. From there it is all read and run until you get to the last drop, right above take out. I recommend scouting on the river right side. The lead in is a few holes to watch out for, the crux of the rapid is at the bottom. You can run left or right on the island at the bottom, depending on the water level the left line is rough but if you stay on the left side and don’t mind nailing some rocks you’ll be fine. If you want to go for a bit more, running the right is good to go. Take a good look at it before running. I tend run the same line every time, fall into the top hole with right to left momentum and then slide or boof depending on the flow just to the right of the island. This guidebook entry was created by Luke Pascucci. HISTORY: The first use of the Middle Fork of the Feather River was for mining. 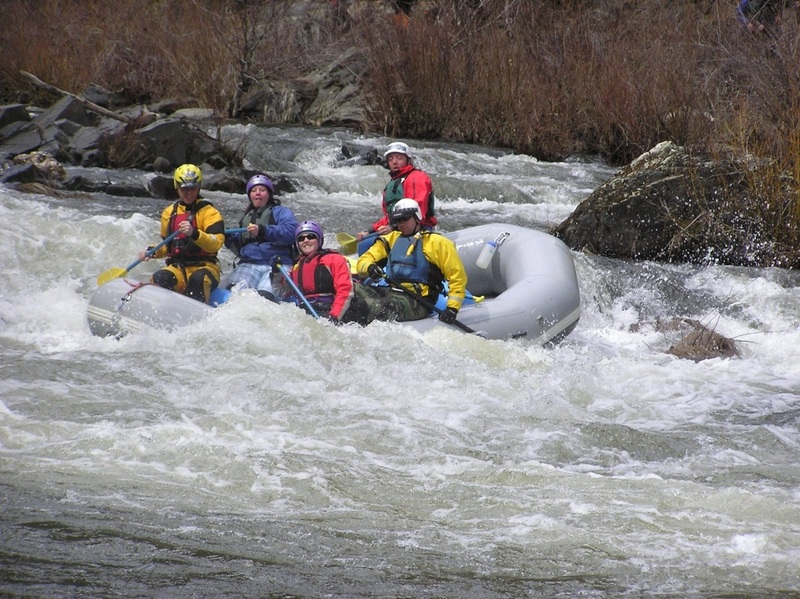 The river was also in the original list of rivers listed in the Wild and Scenic Rivers act of 1968. The Middle Feather now flows into Lake Oroville. The Take-out is at Red Bridge, which was painted bright red until recent years. AREA DESCRIPTION: The Middle Feather starts in the mountains around Sierra Valley. It flows from there into Maybe Canyon near Portola, and then towards Sloat. After reaching Sloat the river flows gently down through class II and class III rapids until Red Bridge is reached. After Red Bridge, the Middle Feather tumbles down into remote class V gorges. TAKE OUT: from Quincy, drive east on Hwy. 70 until you reach La Porte Road. Take a right on La Porte Road and follow it until you get to the first bridge. The river access is on river right and on the downstream side of the bridge. NAME: Sloat to Red Bridge on the Middle Fork of the Feather River. TIME REQUIREMENTS: Four to eight hours, depending on flows and how the fish are biting. DIFFICULTY RATING: This is a class 2, 3+ section of river. It is remote and isolated once you leave the put-in. GEAR NEEDED: your basic paddling equipment, lunch, and water. DIRECTIONS: Once you are on the water, the first big rapid is the Trench. Scout on river right. The Trench is a short ledge drop that is usually run right of center. Almost Famous comes next and can be scouted from the river left side of an island. At high flows a sneak develops in the river right channel. Almost Famous is the hardest rapid on the run and is a long boulder garden with two big holes at the bottom. After Almost famous you can kick back and enjoy the rest of the scenery and fun splashy water. This guidebook entry was created by Israel Jones. HISTORY: Located in Quincy, CA, this section of Spanish Creek, along with others, was heavily mined for gold during its early settlement in the 1850s. 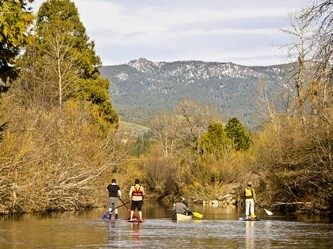 Located in the Sierra Nevada Mountains, this area is known for its protected national forest, impressive landscapes, and awesome recreational activities. AREA DESCRIPTION: This gorgeous section of Spanish Creek features beautiful scenery, water features, wildflowers, ranches, and a diverse bird population, all in a local environment. What makes this section of Spanish Creek really great is your ability to view all these great features without having to leave the Quincy area. DIRECTIONS: Put-in is on the Feather River Campus. To the left of the football field, about a five minute walk from the ORL gear room. Walk from the ORL gear room towards the FRC football field. Following the road towards the football field, once the field is directly to your right you should see a gated area on your left. You will have to push your SUP under the gate and jump over it. From here, Spanish Creek is visibly straight ahead and about a 50 foot walk. RISKS/PITFALLS: Barbed wire fences are stretched across two sections of this run. One barbed wire fence is also stretched across, but is held about five feet above the water. There’s also several willows placed on ideal lines that can work as a strainer and should be avoided.